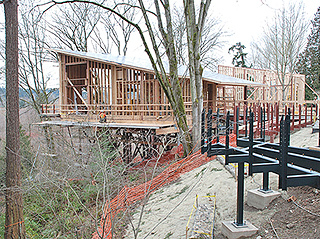 Mercer Slough Environmental Education Center in Bellevue is being built in a 320-acre wetland nature park. The site has guided design and construction, and forced the design team to get creative. 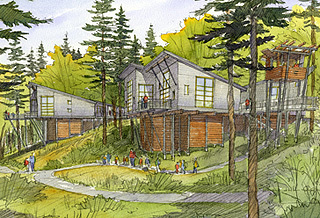 Mark Johnson of Seattle's Jones & Jones Architects and Landscape Architects has been working on the Mercer Slough Environmental Education Center in Bellevue for eight years, and he said it is gratifying now to see the project taking shape. “When I started seeing these buildings go up, I kind of had to pinch myself,” he said. The center is located in Mercer Slough, a 320-acre wetland nature park, and has a long and daunting history. It is a partnership between the Pacific Science Center and the city of Bellevue, and in 1999 was estimated to cost $3.5 million. The cost today has risen to $10 million, and keeping it there is a challenge because the site is next to a wetland and on a 40 percent slope. Once complete, the 10,000-square-foot center will be used as headquarters for Bellevue's Department of Parks and Community Services, and as a learning space for Pacific Science Center. Construction should finish this summer and classes will start in the fall. It will have two classroom buildings, a multipurpose building, a visitor's center and two wetlabs. Buildings will be elevated into the tree canopy, as much as 30 feet above ground. The wetlabs and a restroom building will be on the ground and have green roofs. Cantilevered footings allow visitors to be close to trees but keep the structure further away from the roots. The site has guided design and construction. Johnson said buildings were located in areas where there were no healthy trees to minimize disturbance. The 40 percent slope determined how the team built. The project is designed to be light on the land through a variety of low impact techniques. Pilings and a steel substructure support the buildings, rather than flattening the ground to create a base. This will allow water to flow underneath when it rains. Cantilevered footings allow the building to extend up to 15 feet over the base so visitors will be close to trees but the structure will be further away from the roots. While the building portion of the project has stayed on budget, the earthwork has not. To keep costs down and encourage innovation, all team members were encouraged to bring ideas and experience to the table. Johnson said collaboration made the project possible. Keith Michel, project manager for contractor Berschauer Phillips Construction Co., said the project has been a challenge due to the nature of the site. All equipment was chosen for its size, weight and maneuverability. The team and all its equipment has to stay within five feet of the project's footprint. That creativity has led to a number of innovations to keep site impact light and cut costs. For example, Berschauer suggested extending beams beneath the elevated buildings to create a workspace around the building, rather than using scaffolding. Michel said this saved about $40,000. Johnson said some beams will be kept to make maintenance easier. Another idea came from subcontractor McCaan Heavy Hauling. The parking lot for the center is located over peat that is 12 feet deep in some areas. Instead of using expensive foam below the concrete to create a stable base, McCaan suggested preloading the peat to push the liquid out. The idea was accepted and four feet of gravel has rested on the peat for almost a year. The gravel will later be reused for paths on the site. The design originally included a tram to travel up and down the hillside. Now two vertical wheelchair lifts are being used instead, saving about $50,000, Michel said. Michel said Berschauer's original bid for the project cut costs by about $200,000, allowing the project to be awarded. Further innovations have offset additional construction costs. The project is targeted to reach at least LEED silver. Once certified, it will be Bellevue's first LEED building. Other green features include a natural ventilation system and recycled materials. For example, the 30-foot pilings from Seattle-based Heatanchors are reused pipes originally used to retrieve gas from the ground. Johnson said the center will change the way Jones & Jones looks at projects in the future. He said the project is also a great example of “landscape ecology” because the building works with its landscape so you can't decipher whether an element benefits civil engineering, landscaping or architecture. Often, one aspect will work to the benefit of all three, he said. The center also brings together the slough and the city. The skyline is visible from the highest tree houses and Johnson said traffic on nearby freeways sounds like a waterfall. “To have something that's this special so close to an urban environment is very powerful,” he said. Other team members include Lund + Everton Structural Engineering, structural engineer; Stantec, mechanical and plumping; Sparling, electrical; Pace Consulting Engineers, civil engineering; Bartlett Design Co., interiors; Shannon + Wilson, geotechnical design; HayreMcelroy + Associates, geotechnical construction; Davis Langdon Adamson, cost estimating; Vicki Morris Consulting Services, SEPA/NEPA permitting.